On tour in Georgia, a British actor and his girlfriend are captured by Chechen rebels. Several Russian prisoners are also taken captive, and the group is transferred to a remote village in Chechnya. Thrown into a hole that contains several Russian conscripts, the British couple are held ransom. When the ransom doesn't materialise, the actor is released in order to raise cash in Britain. Upon his return, he meets a conscript who is also desperate to save another captive, and the two join forces. 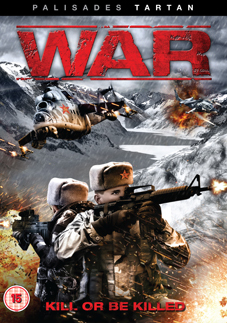 Enlisting the aid and muscle of the Russian military, the two head back to the Chechen village and wage a two-man assault that will soon become an all-out war. Starring Aleksey Chadov and Ian Kelly and helmed by Aleksei Balabnov, the award-winning writer-director of the Brother gangster films and the critically-acclaimed Of Freaks and Men, comes War (Voyna, 2002), an intense and uncompromising look at the brutal atrocities faced by captives during wartime. Explosive and controversial, Aleksei Balabnov's film features realistic action sequences interlaced with dramatic tension, as good people fight to see loved ones returned safely home. War was nominated for Best Film at the Nika Awards (the Russian equivalent of the Oscars), won for Best Cinematography at the Russian Guild of Film Critics, and Chadov earned a Best Actor Award at the Montreal World Film Festival for his gripping performance.